Putting new guitar strings on your guitar can make a big difference to your playing. Everything sounds brighter, cleaner and the notes have more sustain. 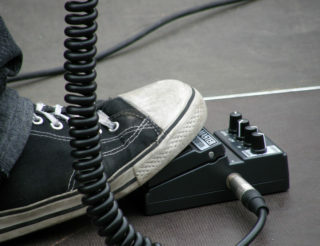 It can breathe new life into your playing as well as improving your guitar’s tone. A problem is that your strings can deteriorate quite slowly depending on how often you play and where you live (humidity in the air could ruin strings very quickly) and you may not realise just how dull and unresponsive your strings have become until you change them — and have a “wow” moment about how great your guitar sounds again. Buying new guitar strings either in a store or online will have you confronted by a bewildering array of choices. Here are the important things to know, when you’re purchasing a new set. This seems an obvious question, but let’s answer it anyway. 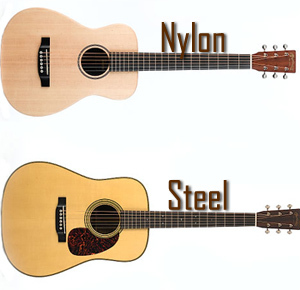 Steel guitar strings are for traditional dreadnought-style acoustic guitars. Nylon strings are for classical or flamenco guitars. Make no mistake, these aren’t interchangeable. Don’t buy the wrong type just because they’re on a super-special, discount deal thing. If you put nylon guitar strings on a steel-string guitar it’s going to sound like crap. By the way, if you put steel strings on a nylon-string guitar the extra tension is likely to snap your instrument into matchsticks or at best rip the neck off… need I say more? This is important for many reasons. The “gauge” of your guitar strings determines how thick they are with larger gauges called “heavy” and the smaller sizes “light”. When you first bought your guitar it will have strings fitted that are best suited to the instrument’s set-up, in particular the tension on the neck’s truss rod. If you decide to try a different gauge to complement your playing style, chances are that truss rod will need adjusting. It’s all about the sheer pull those six strings exert on the guitar’s neck, which is a lot at any time. 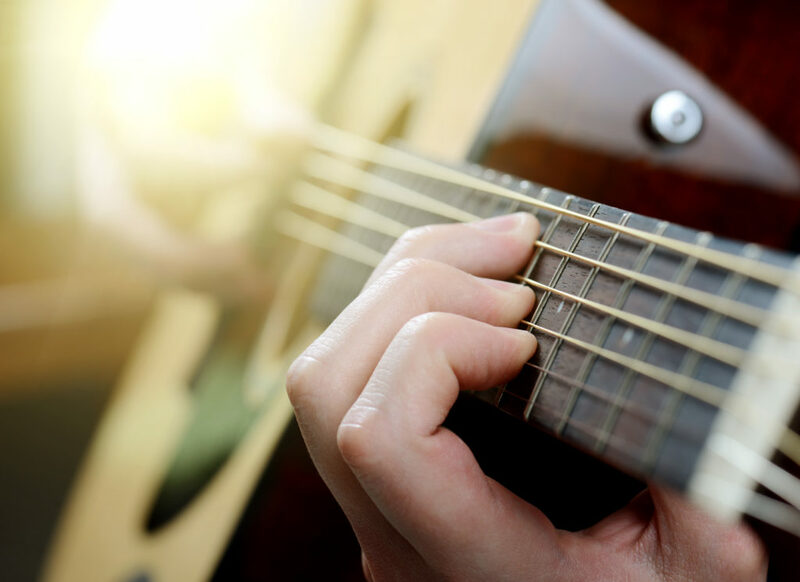 Heavier strings will apply more tension, bend the neck upwards more and increase the action of the fingerboard (the height of the string above the fret board) making it harder to press the strings down. Lighter strings can have the opposite effect allowing the truss rod to over-compensate and the neck will straighten too much, lowering the action to the point where the strings will rattle on the frets. By now you’ll have figured out that a guitar’s set-up can be a delicate balance of truss rod tension, bridge height and nut adjustment to achieve that perfect playing action on the fret board. Which is why it’s strongly recommended to stick with whatever string gauge you prefer once you’ve chosen what’s best. 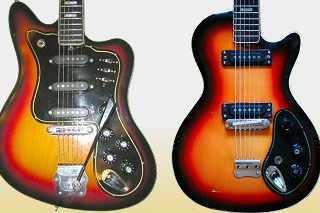 Get your guitar adjusted accordingly and it should stay that way. Heavy strings are louder, have extra body and sustain, and better low-end tone. Not surprisingly, they’re more resistant to breaking, so if you’re a hard player with lots of energetic strumming then higher gauge strings are for you. 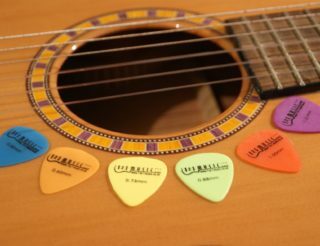 However, if you want to get clever and start bending strings or trying more delicate playing techniques such as finger-picking, lighter gauges will help. You’ll sacrifice some volume and bass, but the tendons in your hands will thank you. String manufacturers make it easy for you by providing a good range of gauges including compromises such as “medium” or “custom light”. If you want to get really fussy you can buy the individual strings and create a custom set of your own. That’s not as silly as it might sound. You may discover your playing style constantly breaks a certain string and the answer can be to increase the gauge just on that one string. Just like the string gauge can affect the tone of your guitar, the metal composition of the string does too. It really comes down to personal preference here. Brass strings aren’t too popular, because they’re simply too harsh and in your face tone-wise. Almost banjo-like in sound, they can cut through a noisy mix or make you noticed if you’re busking on the street, but most players consider brass strings as akin to bashing tin pots in your ear. Which is why you won’t find a lot of choice available. Bronze strings also have a bright sound without being over the top and they provide plenty of sustain. Unfortunately bronze is very vulnerable to oxidising (rust, basically) and these strings can turn dull quickly. If you like a clear, crisp tone then bronze strings will do the job, but be prepared to clean them often and replace them a lot. Phosphor Bronze is a good compromise. I still find them nice and bright when they’re new and with some diligent cleaning a set of phosphor bronze strings will last quite a while. I’m not alone, they’re easily the most popular type of string. Steel strings — yes, there is an actual steel string — usually have a wrap of nylon or even silk around the lower strings so it’s not like playing a bunch of fencing wire. Again, a bright and somewhat harsh tone allows steel strings to be heard better, so they’re popular in folk bands and such when you’ve got lots of other stringed instruments like fiddles and banjos competing. If you find steel strings too loud, try locking the banjo playing in the toilet instead. “Coated” or “long life” strings come in most types with a polymer coating to help slow the corrosion that is the bane of all strings. They cost more and the balance of economics is up to you — do you pay extra and change your strings less or save money and replace them more often? In an unfriendly environment like the humid tropics coated strings are a good idea. Maybe you’re in the habit of leaving your guitar lying around, the strings exposed to the air? Coated strings are usually slightly less bright because of that coating, but I’ve recently found a brand that sounded over bright as if the manufacturer has found a way to fix this problem — it took a few gigs for them to settle down. You might have noticed a recurring theme in all this — that regularly cleaning your strings is an excellent idea. The perspiration and oil that come out of your own fingers is the villain that causes corrosion and a build-up of gunk (a highly technical guitarist term) on the strings. Even just wiping your strings with a clean, dry cloth after each session will help a lot. You can buy any of a myriad of string-cleaning products in sprays, roll-ons and cloths impregnated with a magic elixir — and generally they all work, because these all contain a mild cleaning detergent to break down those oily secretions. In truth, the real magic comes with making a habit of swiping those strings with a cloth each and every time you finish playing. Last, don’t be tempted to use non-guitar cleaners. Ordinary household detergents and polishes can be too harsh on that bronze string, not to mention your guitar’s timber. Never use nylon strings on a steel string guitar. Once you’ve decided on a gauge to suit your playing, have your guitar set up properly and stick with that gauge. 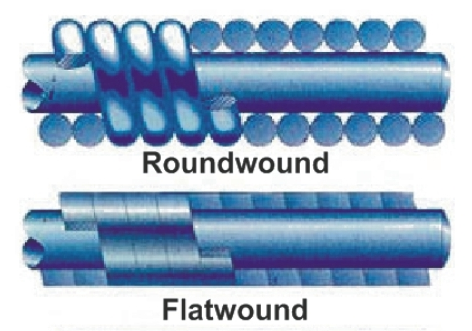 Different types of string like bronze or steel sound different. Experiment if you like, but don’t forget to stay with that same gauge. Coated strings last longer, but cost more. Do the maths to see if these suit you. Always clean your guitar strings after a session. Get into the habit.